Kaul — a boy on the brink of manhood — is torn in two when his alternately loving and abusive father is turned into a crippled beggar. Can a wizard who deals with demons help Kaul bring his father home to the healing country of Leal? First published in “Beneath Ceaseless Skies,” May 5, 2012, “To Go Home to Leal” is available in the Kindle Store. 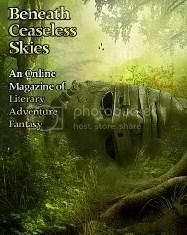 Once again, Beneath Ceaseless Skies features moody and atmospheric stories in their issue #94. “To Go Home to Leal” is set in a port city where Kaul works at odd jobs just to stay afloat. His father Daugh has had his hand cut off as a thief and longs to go back to his home in Leal, but thieves are not allowed in. Kaul comes up with a plan involving a wizard and a magic spell that will allow them both to return, but things don’t go quite right, and not in the way I may have implied by those words. Susan Forest adds some unexpected and fascinating complications and gives Kaul a heart-wrenching dilemma in the end. I found the ending unexpected, though oddly right. The ending is quite arresting. I felt relief at Kaul’s final choice, and then I was ashamed, and that’s an awesome thing to evoke from an audience. Loved this story. I won’t spoil the plot of it in my praise, but it had me by the nose all the way through, and, like a character caught in a story, I did not know which way things would turn out. This, to me, is one of the key things in story-telling–to make the inevitable ending in the writer’s mind become the consequences of a character’s choices. An excellent tale. Thanks. Check Susan’s Curious Fictions page to read “To Go Home to Leal”.